A 33 year-old (60-kg) male is brought into your emergency department by EMS and appears to be in excruciating pain. As EMS is transferring the patient, they explain that the patient was mowing grass on a steep incline about 40 minutes ago when the lawnmower slid over his right foot causing amputation of his first through third toes. The toes were placed on ice and the patient notes no other injuries. No pain medicine has been given. Nursing obtains vitals which are normal aside from some mild tachycardia. IV access is obtained. 6-mg of morphine is immediately administered after the patient confirms no allergies. Head to toe assessment and review of systems reveals no other injuries aside from the toe amputation of the right first through third with all three amputations occurring through the proximal phalanxes with pieces of bone jutting out and bleeding well controlled. The patient denies any past medical history. You quickly identify that this is a Gustilo Class IIIB open fracture and you order IV cefazolin, gentamicin and you throw in some penicillin because of your concern of anaerobes as you find the amputation occurred on a farm. You have the toes, which appear fairly well preserved, wrapped in moist gauze, placed in a bag of normal saline and placed on ice; you take special care to not have the toes directly placed on ice. 20 minutes has passed and re-evaluation of the patient reveals that he is still in excruciating pain, so you repeat the morphine. You call your orthopedic doctor on call who commends you on the antibiotics, says that they typically will not reattach toes, but she does agree that the wound will need to be taken to the OR for a wash out. Unfortunately, she is stuck in another case in the OR and it will probably be 2-3 hours before she can take him because a pretty involved trauma case just rolled in several minutes ago. The orthopedic surgeon asks, “Can you keep the patient comfortable until then?” Meanwhile the patient’s nurse approaches you and states that the repeat morphine has barely touched the patient’s pain. You repeat the morphine, but you think: what are my next steps in pain management? In basic terms, regional blocks involve injecting lidocaine or bupivacaine near a peripheral nerve to achieve some regional anesthesia. So when do you do it? Ultrasound: your friend in the nerve block world. Ultrasound allows you to see your needle at all times and you can see the spread of the anesthetic! Basically, there are five nerves to that innervate the foot. 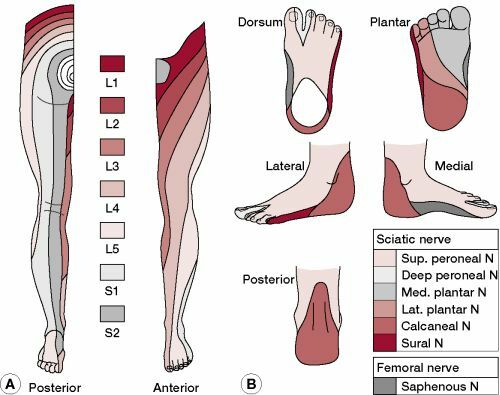 If you know your anatomy, you can limit the nerves you want to block based on the area of the foot that is injured (keeping in mind that anatomy is variable and dermatomes are not the exact same as they appear in the Netter textbook). How: Palpate the posterior tibial artery behind the medial malleolus. Inject 3-5-mL of anesthetic 1-cm in depth 1-cm superior to this point. How: Inject 3-5-mL of anesthetic subcutaneously in a band between the Achilles tendon and 1-cm above lateral malleolus. How: Inject 4-10-mL of anesthetic subcutaneously in a band between the lateral malleolus and the extensor hallucis longus tendon. How: Have the patient dorsiflex their foot and insert the needle 1-cm above the medial malleolus aiming underneath the extensor hallucis longus tendon and advance until you hit the tibia. Then inject 3-5-mL of anesthetic. How: Inject 2-5-mL subcutaneously between the medial malleolus and the anterior tibial tendon. The 5 simple steps of the ankle block rely on landmarks. However, at least with the posterior tibial nerve block, ultrasound has been shown to be superior with providers who know what they are doing (see references). It follows that the deep peroneal nerve block may also benefit from ultrasound. The other three blocks are SQ infiltration, so probably not a huge need for ultrasound in those. If there are substantial orthopedic injuries which will require consultation, beware of the block. Many orthopedic surgeons want their own neurological exam before you do the block. Extensive review of literature could not find a study of how good emergency department physicians are at ankle blocks. One would guess that success varies on experience. But do not let that deter you from attempting an ankle block. The risk/benefit is good as long as you take precautions. The patient has had a total of 18-mg of morphine over the past 40 minutes, but continues to be in pain. You consider switching narcotics or starting a PCA and continue to treat the patient’s pain, however, you elect to quickly do an ankle block. Patient immediately notes relief of pain and promises to name his next child after you. He is eventually taken to the OR and his wound is washed out and skin flaps are done and so on and so forth. Redborg, K., Antonakakis, J., Beach, M., Chinn, C., & Sites, B. Ultrasound Improves the Success Rate of a Tibial Nerve Block at the Ankle. Regional Anesthesia Pain Medicine, 34, 256-260. Roberts, J. R. (2004). Nerve Blocks of the Thorax and Extremities. Clinical procedures in emergency medicine (4th ed., ). Philadelphia, PA: W.B. Saunders.